Las Vegas at night. Earth Observatory photo. It's been a little over a month since my last post, a major no-no for bloggers interested in developing their online presence and overall platform. That would be me. Nonetheless, I have been preoccupied and here's why. Success Finding A Job has a new office, 8565 S. Eastern Avenue, # 184, Las Vegas, NV 89123. For those familiar with the area the cross streets are South Eastern and Wigwam, just north of the Eastern / I-215 interchange. The Henderson city limit is just across the street (east side of Eastern) so for all intents we're located there too. 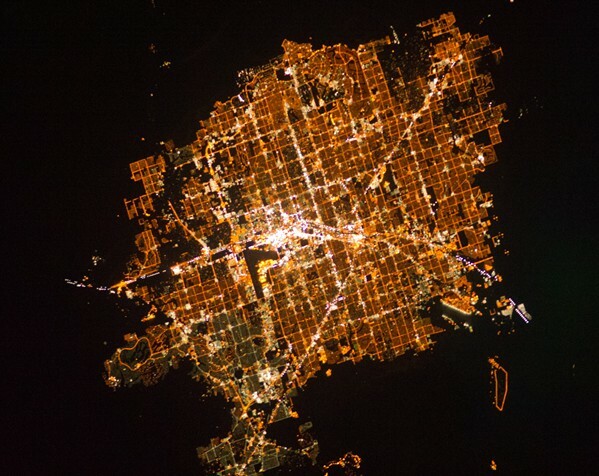 If the Vegas at night photo were a turtle (with it's head pointing toward the lower left corner) our location would be on the shell just in back of the head. It's a great location just off I-215 and near Green Valley an area I have come to like very much. So ... I am jazzed! This is a wonderful environment in which to meet clients individually as well as in groups. It's a wired hi-tech building filled with niche specialist professionals providing services in a wide variety of fields. And, there's ample parking all around the building. Okay. Now it's time to get back to blogging and finishing my e-book (my inner parent is not happy). Also on the burner, a series of tip-books, geared to specific job search techniques. It fact, the first of these may beat the e-book to the Marketplace. In the meantime I am planning and looking forward to a new office roll-out in May. Doubt you'll be able to spot this from space but we'll have a nice time just the same.